Today I took just Baby for a (very short), hike through the woods. In a scarf, I introduced her to one of life's great pleasures--throwing stones into the stream, creating a cumulus cloud of mud, slow to settle. I'm constantly surprised by details--how much sound is absorbed by woods and the new sounds you enter into, the cracking sticks, the pop of acorns falling, wind in the leaves. And as I turned around I could almost see my brother, ten years old again. I feel like I've landed on a different planet, inhabited by mine and Husband's past. Now to continue the work of carving out the present. 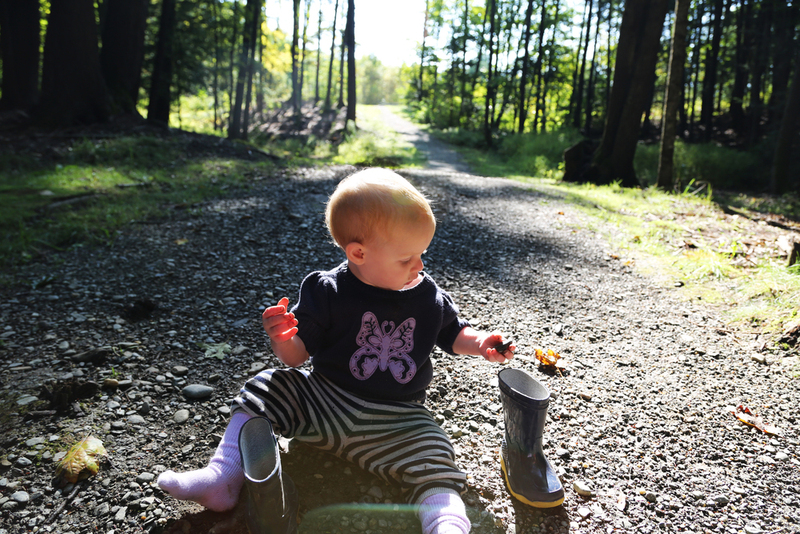 Baby, however, mostly preferred to sit in the mud and put tiny rocks into her boot, one by one.